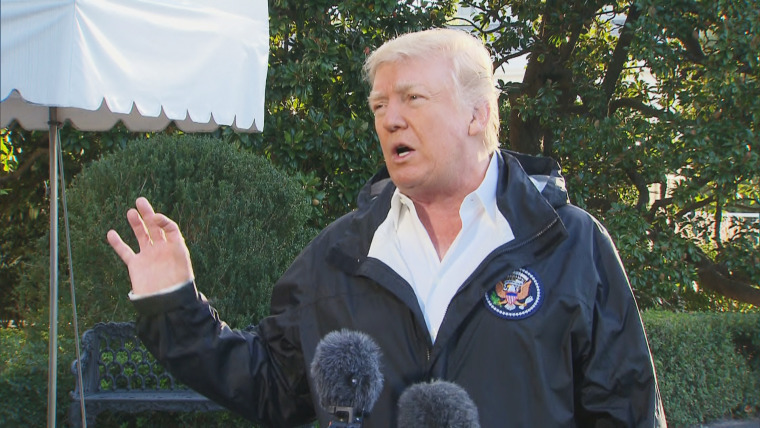 President Donald Trump on Tuesday called the suspect in the worst mass shooting in modern U.S. history a "sick" and "demented man." "He's a sick man, a demented man, lot of problems, I guess. We’re looking into him very, very seriously," Trump said about Stephen Paddock, the suspected gunman behind the Las Vegas massacre that left 59 dead, including the gunman, and more than 500 injured. "We’re dealing with a very, very sick individual," Trump added, as he prepared to board his Marine One helicopter as he makes his way to Puerto Rico to see the storm damage. Trump, answering shouted questions about whether the attack should prompt stricter gun control laws, added that, "We'll be talking about gun laws as time goes by." "Look, we have a tragedy. What happened in Las Vegas is in many ways a miracle. The police department has done such an incredible job," he said. Trump did not respond to questions about whether the shooting was an act of domestic terrorism. Trump’s public comments about the devastating attack were his second in as many days. On Monday, just hours after Paddock unleashed his rapid-fire barrage of bullets from the 32nd floor of a Las Vegas hotel, Trump, speaking at the White House, called the shooting "an act of pure evil." Trump is scheduled to visit Las Vegas on Wednesday. Paddock, 64, of Mesquite, Nevada, fired shot after shot from his room at Mandalay Bay Resort and Casino down on the crowd of about 22,000, sending terrified concertgoers running for their lives. His attack was met with immediate calls for action on gun control Monday from several Democratic lawmakers.